Japanese food has become very popular lately, but less well known is the essential role of Dashi in Japanese cuisine. Japanese food tend to have minimal seasoning in order to appreciate the taste of the ingredients, therefore, depending on whether Dashi is used or not, or even their types, the tastes vary significantly. For this reason, there has always been work investigating the types of Dashi as well as the method of making them. It is even believed that the person who masters Dashi can make the best Japanese food. So, what is Dashi, this foundation of Japanese cuisine? It is believed that Dashi has been used in Japanese food since far back in the history. Originally, people unintentionally got Dashi out of some food while cooking and that flavoured food. It is believed that then, in about 7th Century, people started making Dashi intentionally and as time went on, people started using different ingredients to make Dashi and also started writing about it to pass on the knowledge to the wider mass. By the time of Edo Period, Dashi was introduced in many texts and people talked about Dashi – own unique ways of making Dashi and different ingredients they could use. It was around then, when the Dashi as we know it today was established. The presence of Dashi in Japanese people’s life became increasingly prominent and people came up with new ideas and exchanged those ideas by books. At present, different regions use different ingredients and they also use different methods to make Dashi – giving rise to their own, unique tastes for their regional cuisines. Japan is not the only country that uses Dashi. Different dashi is present in foreign cultures as well and their flavour is equally high quality. For instance, bouillon and fond de veau are very famous stocks and they are widely used in cooking – these stocks make the dishes even more delicious. There are many differences between Dashi and stocks, but the biggest difference is the ingredient and the duration of preparation. First of all, while Japanese Dashi uses only few ingredients, stocks used overseas use many different ingredients and make sophisticated flavours. Secondly, while Japanese Dashi can be make within a few minutes, stocks usually take more than 10 hours. While normally stocks are made using various ingredients, such as vegetables and meat, together, Japanese traditional Dashi tend to be made using coupe of simple ingredients or even using only one ingredient. Commonly used ingredients are seafood and mountain products, such as dried fish (commonly dried bonito or mackerel), dried seaweed (konbu), mushrooms such as shiitake mushroom, dried shrimps and clams. Partially because meat was at one point forbidden in Japan, meat was not used to make Dashi. However, as meat became more widely eaten, because it has little flavour, the use of Dashi to add deeper flavours became more important and it is believed that this made Dashi an essential part of Japanese cuisine. Although Japanese Dashi is very simple, by changing the type of Dashi for different dishes, the final tastes of the dishes differ significantly. It is often found that the ingredients for Dashi are chosen from things made in different types of places from the ingredients of the dish – for instance, using mountain products like mushrooms for Dashi when you are cooking fish and using fish Dashi to cook vegetables. In this way, the flavours are deepened by matching up different types of flavour. Besides, because it meat is widely eaten these days, in order to enhance the tastes of the meat, new attempts, such as making Dashi from multiple ingredients or making Dashi using meat, are made and new Dashi are increasingly being used. Thus the variety of flavours has increased dramatically compare to the past. The beauty of Japanese Dashi is that anyone can easily use it. You can buy ingredients that are already been prepared and In fact, there is not much you have to do yourself. In addition, unlike the stocks overseas, it does not take hours to make – Dashi can be made by simply soaking the ingredients in the boiling water for couple of minutes. In fact, it even spoils the taste to cook it too long – you need very different mentality from how you would make stocks. Besides, these days for people who cannot be bothered to make from the ingredients, there are powders made out of various ingredients in the shops. You can make Dashi by just pour some hot water, so if is very popular among people who do not have much time for cooking. 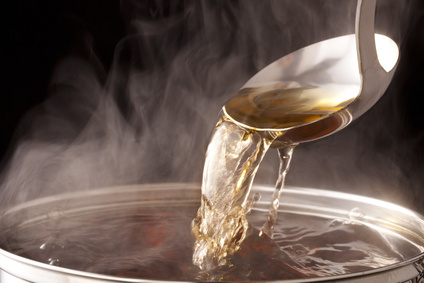 Because Japanese food tries to utilise the original tastes of the ingredients, it tends to be simple – this is why Dashi has such an important role in perfecting the tastes for Japanese dishes. It is often said that mastering the Dashi making for each ingredient can improve your cooking a lot – I would highly recommend that you learn Dashi making before trying cooking Japanese food.